A romantic conversation over food can enhance your experience in many different ways. Valentine’s Day is a special day and people of all ages celebrate it in their own small and big ways. From college teens to senior citizens, everyone has their own way to have a great time with their special ones. If you are planning to propose or surprise her on this special day there is nothing better than a lunch or dinner date. A bit of research can provide you with the best places to celebrate Valentine’s Day in Mumbai. This would be a great Valentine Day gift that you can give to your loved one. There is no dearth of restaurants that you can find in the city. However, here is my list of the best romantic restaurants in Mumbai that can offer value for money deals. The winter chill has already begun to sweep in gradually across Maharashtra, although it is too early now because it’s still the last week of December and there is so much of winter to come around. To some extent, I believe people are already focusing on where they will spend their Christmas holidays and how they will spend their money celebrating in their own small and big ways. No matter what time of the year it is, I have seen people packing their bags and heading to either Lonavala or Mahabaleshwar that manage to attract more visitors from Mumbai and Pune and other parts of the state. India is the land of festivals but Diwali is certainly one of the most anticipated festivals of India. Like many others, I am always excited to celebrate this festival with my friends, family and colleagues. One of the best things about Diwali is that people from all walks of life and different religions, regions and state celebrate it with the same joy and excitement. It is the festival of lights that inspires all of us to spread the love and happiness and to drive away the darkness, sorrow and negativity within and around us. Being a shopaholic, shopping is what excites me during the festive season and being a Mumbaikar I am always looking for places for Diwali shopping in Mumbai. In the third and final part of the Lohagad Fort trek series, we focus on the experience of climbing up the fort. The first part of the trek focuses on the Bhaja Caves Lonavala. In the second part, we focused on the Bhaja Caves to Lohagad Fort base. Lohagad Fort is at an elevation of 3,389 feet above sea level. In 1648, the fort was taken over by Shivaji Maharaj. The fort was captured by Shivaji Maharaj in 1648. However, he surrendered it to the Mughals in 1665 under the Treaty of Purandar. He recaptured it later in 1670. Having fun amidst the rain while trekking has its own level of excitement. When the Southwest monsoon winds bring the clouds hovering above Maharashtra, it’s time for the trekkers and nature enthusiasts to climb up the mountains and forts that can offer them some adventure and exhilarating fun. The Western Ghats offer so much more to the trekkers and nature lovers who want to explore the rugged topography and rocky mountains and walk through the extensive forest network that otherwise remains unexplored. In my previous post, I covered trekking destinations in Maharashtra for basic and medium level trekkers. In this one, we continue our trek journey, but focus on places that can raise the bar to the next level. I’ve really covered so much about Maharashtra in some of my previous posts that I sometimes feel that there is nothing more that I can write about Maharashtra, but I’m glad I’m wrong and that new ideas emerge where I can showcase the beauty of my state across the globe. During the summers, Maharashtra can be really hot and it can make you sweat like anything, but the scenario changes only a few weeks after the arrival of the monsoon. The thundering black clouds shower over the Western Ghats for days and weeks and transform the hard, rocky and dried up mountains into a carpet of lush green with river water gushing through the mountain cracks offering life to the entire ecosystem in its way. While many would prefer to stay indoors, thousands prefer to venture into the wild for an adventurous trip that they’ve been waiting for. 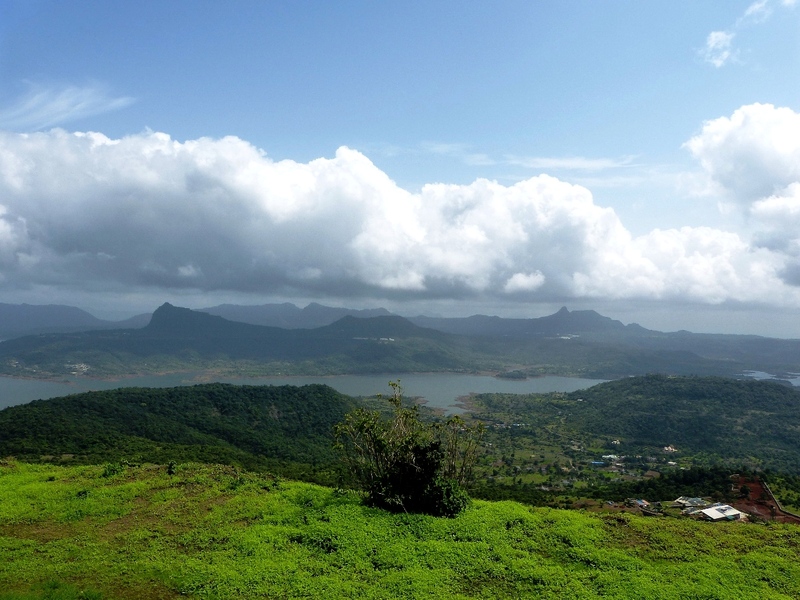 Trekking in Maharashtra during the monsoon is something that can provide you with a pleasurable feeling like no other. All you need to do is pack your gear, muster up your courage and prepare to conquer these mighty mountains that can offer nature in its purest form. If you’re in Maharashtra and if you want some adventure trekking some of the nearby destinations with friends and family would be an ideal way to break the monotony of your routine life and be close to the Mother Nature. Let’s take a quick look at the top 5 trekking destinations in Maharashtra for basic and medium level trekkers.